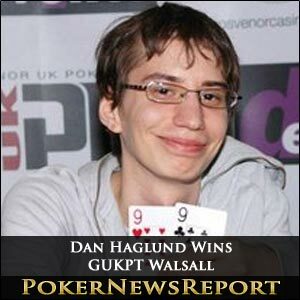 Swedish online specialist Dan Haglund believes he “ran pretty good” to record a victory from his first ever Grosvenor UK Poker Tour (GUKPT) start when taking down leg 2 in Walsall for £45,100. The Tibro native enjoyed his three days in the West Midlands of England as he defeated Steve Holden – a GUKPT regular – in their heads-up battle during the £1,000+£70 buy-In main event at the town’s Grosvenor Casino. Haglund, of course, outlasted 152 other entrants to collect the top prize, but had to fight back from a slight chip deficit in his head-to-head with local player Holden – who had turned his Day 2 short stack into a challenging pile – to eventually take the lead on what was the penultimate hand of the tournament. The Swede finally took the title during the second hour of heads-up play when Aston Villa Football Club fan Holden – who qualified for the event after investing just £10 in a satellite tournament – moved all-in after Haglund had made a pre-flop three-bet. The Englishman, on the button, opened by making it 40,000 to go, only for big blind Haglund to three-bet to make it 125,000. Holden knew this was a big decision and even removed his headphones to help his thought processes – before eventually announcing that he was all-in. Holden showed 4♥ 4♦, but found himself as a massive underdog as Haglund revealed 9♣ 9♥. The Q♣ 8♣ 2♣ gave the Swede a club flush draw, leaving the English player with only the four of spades to save his day. However, the 10♥ arrived on the turn and the 10♠ came on the river, so confirming Haglund as champion to leave Holden with yet another cash, this time £31,750, from the GUKPT. Haglund spoke to fellow pro Phil ‘The Tower’ Heald on the live stream soon after his victory, admitting that, after making the nine-handed final table, he “wasn’t thinking too much, to be honest”, about his strategy for success. Instead, the self-effacing Swede “just tried to play decent poker” as he charged to glory in what was his GUKPT debut and biggest cash of his live career after collecting approximately £40,500 for his eighth place finish in event #8 – a $1,000 by-in No-Limit Hold’em tournament – at last year’s 42nd staging of the World Series of Poker (WSOP) in Las Vegas. Frequent GUKPT casher Holden, meanwhile, only just missed out on a place at this year’s Champion of Champions event, although he will surely still be aiming to secure his seat in the 2012 tournament and hope to better his runner-up spot from 2010, when he pocketed £31,125. In what was a strong field, leading players such as Stuart Fox, Jerome Bradpiece, Sunny Chattha, Jeff Kimber, Dan Carter, the experienced Mickey Wernick, Stuart Rutter, Julian Thew and Chaz Chattha hit the rail on Day 1 of the event – as did the Nottingham-based in-form Russian Ruslan Vlasov after the former Dusk Till Dawn dealer had opened 2012 with two victories in England. Meanwhile, the tour’s opening winner this season, Scotsman Lewis Hunter, could not repeat his Manchester performance from late January as he joined every other previous winner on the sidelines – although the Bathgate player crashed out early on Day 2 but still without cashing. Day 2 closed with the fight to make the final table, with the unfortunate bubble boy being Anthony Gaughan, who picked up £2,680, which was, of course, more than the £2,300 collected by Sam Grafton (15th) – who was aiming to make his fourth GUKPT final table appearance – Jonny Zaib (14th), Pete ‘The Bandit’ Evans (13th), Suketu Patel (12th) and Chun Law (11th). The first player to hit the rail on the final day was English favourite Simon Deadman, in ninth place for £3,060, after being eliminated by Haglund. Holden made his first move of Day 3 when making it 14,000 to play. But Nottingham’s Deadman then moved all-in, resulting in Haglund asking for a chip count. Once that was done, it was 103,000 to call, and the Swede did just that as Holden folded. Deadman – at his third GUKPT final table – turned over A♠ J♦, only to find himself way behind the A♣ Q♥ of Haglund. The board showed three fives, a 10 and a nine, so sending the Englishman to the rail early than many would have expected, particularly as he had finished third at this very event last year. Thereafter, Birmingham’s Arulmaran Sivaguru exited in eighth for £4,210 when his K♠ 7♠ was unable to improve against the 6♦ 6♠ of Chris Gavriel, while seventh spot went to Cumbria’s Jonathan McCann – for £5,740 – after his pocket nines lost out to Terry Owens’ Big Slick, which improved to trips aces after the flop, turn and river. Gavriel had started the final day well, making much of the early play, but eventually exited in fifth place for £9,560 in the same hand that also saw Liverpool’s Owens hit the rail in sixth for £7,720. Gavriel, with pocket queens, called a pre-flop raise of 25,000 from Haglund, but was surprised to see Owens – for about 140,000 – and then the Swede move all-in. Gavriel called and would have been happy to see himself in front of Haglund’s A-10 and Owens’ eights. However, an ace arrived on the flop to give the young Swede the lead and ultimately eliminate his two opponents as he moved about the one million-chip mark. Fourth place and £12,240 went to yet another Englishman in Dave Clark after Haglund again took down a vital hand. Clark moved all-in late in level 20, with the blinds at 6,000/12,000 and a 1,500 ante, to show A-9 against Haglund’s A-J. The flop showed J-2-10 to give the Swede top pair. Only runner-runner could save Clark now and the eight on the turn actually provided the Englishman with an additional eight outs with his open-ended straight draw. However, a six on the river was not among his outs and Clark left the tournament. Martin Holmes just missed out on heads-up play as he hit the rail in third for £19,980 when becoming the latest victim of Haglund. In the small blind, Haglund moved all-in and big blind Holmes called to put his tournament life at risk. The Swede showed Q♥ J♦, while Holmes revealed A♦ 9♥ to be ahead. But the 3♥ Q♦ K♦ flop handed Haglund a pair of queens, only for the 10♦ turn to provide Holmes with a nut flush draw – if any diamond, apart from the nine, arrived on the river. However, the 10♥ extinguished Holmes’ hopes as Haglund and Holden took a break before their heads-up encounter. Eventual champion Haglund has stated that he is not certain when he will next start a GUPKT event, but it is possible we shall see him line up again when leg 3 kicks off in Stockton on April 8 for eight days of action until the 15th. Leg 3 will feature a £500+£50 Deep Stack main event – from April 13 to 15 – while leg 4 of the tour arrives just a week later in Thanet for eight days from April 22 to 29. That stop – as four from 13 – will offer a £500+£50 Six-Max main event that is scheduled to run from April 27 to 29. Meanwhile, if you are in London today – or can make it down by 20:30 GMT (Greenwich Mean Time) – the Western Club is hosting a £128 buy-in Spring Guarantee event. Never fear, though, as tomorrow will see a second Day 1 at the same time, with the opening flight survivors from the west London venue returning on Wednesday – once again at 20:30 – to make a play for the biggest share of £15,000 prize pool. It’s a bounty tournament, so £25 from each entry is up for grabs, as well, while players can add an additional 10,000 chips to their starting stack of 20,000 by paying an extra £10. The blinds start out at just 25 and 50, while there will be 30-minute levels, so encouraging lot of play. An extra encouragement is the Western Club’s free buffet!